The most common question we get is ” how do you pack for 6 months?” Well, the good news is that the ship does our laundry. 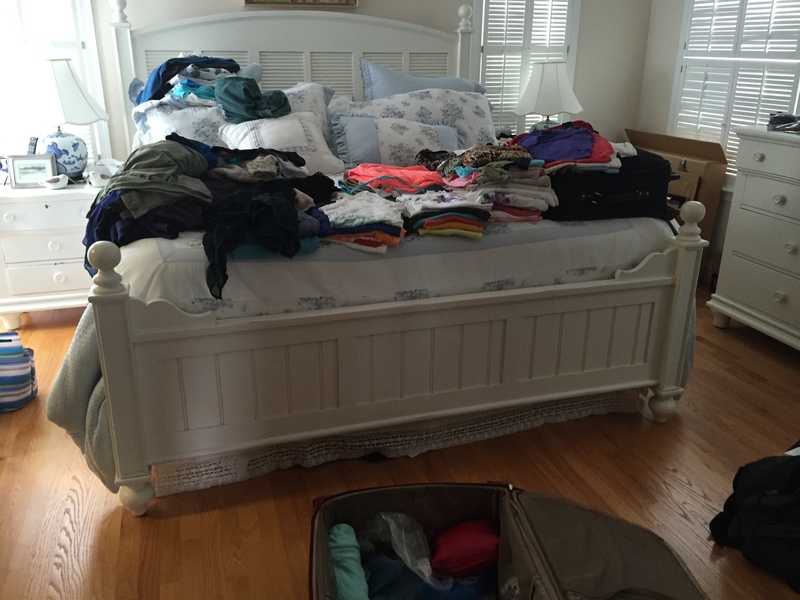 So our answer is typically “you pack for 2 weeks”. Here’s a shot of the beginning of the packing-we are sending three bags directly to the ship and will bring the rest when we fly to Miami. Our sons are meeting us in Boston with our liquid supplies and snorkel equipment so we don’t have to pack those. This entry was posted in Preparation, World Cruise 1. Bookmark the permalink. 7 Responses to The packing has begun! Can’t wait to follow your updates! Wow! That sounds like an amazing trip! Can’t wait to see your updates and follow your journey! I hope you have a safe, healthy trip. I will be following without any danger of seasickness!! Wishing you a fabulous time! I’m looking forward to your updates! Safe & happy traveling!